Rio's Botanical Garden celebrated their anniversary with the revitalization of the Amazonian park area. RIO DE JANEIRO, BRAZIL – The Jardim Botânico (Botanical Garden) of Rio de Janeiro celebrated their 209th anniversary earlier this week (June 13th), with announcement that visitors will be able to experience a piece of the Amazon here in the city, with the revitalization of the Amazonian park area. 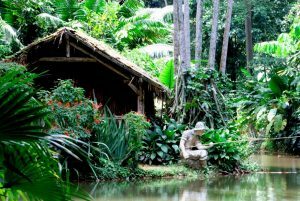 The fisherman’s hut similar to the traditional Amazonian dwellings can be seen at the Jardim Botânico in Rio, photo internet recreation. The cleaning of the small lake within the space was supported by the National Water Agency (ANA). There is also the fisherman’s hut that is similar to traditional Amazonian dwellings inside a small exhibition, along with replicas of animals of the region. According to a government news report, a landscaping project around the lake now displays plants from the Amazon region, including a: rubber tree, kapok, mulatto, açai tree, andiroba, and even endangered plants such as mahogany and Brazil nut trees. The revitalization also included the installation of signs and plates with information about the place and the plants, to help inform visitors. “The main work was to highlight the plants that were identified with plaques, and also […] show what was the intention was when creating that collection,” said Ana Rosa de Oliveira, the researcher, landscapist and coordinator of the Landscape Laboratory of the Botanical Garden. For the Minister of the Environment, José Sarney Filho, who participated in the anniversary ceremony of the Botanical Garden, it is important to open a space, like this one, that shows people the strength of the Amazon, which he says is not just a stock of Greenhouse gases, but offers immeasurable possibilities. The Botanical Gardens in Rio span 350 acres and displays over 6,000 species of plant life and trees. Nestled amongst them are a number of sculptures, architecture and fountains, some of which date back to the early sixteenth Century. The park, which was founded by Dom João VI in 1808, is so popular that it has been proclaimed one of the top ten Botanical gardens in the world, and is also the namesake for the neighborhood it resides in, Jardim Botânico.